The College can point to many statistics for which it can be proud. There are above-average rates in student retention, graduation, and placement in jobs or graduate school, to name just a few. But one recent statistic stands apart. Forty-three percent of the 2017 incoming class are first-generation college students – meaning neither of the student's parents has a four-year degree. That number reflects a commitment to ensuring the College is accessible and students are fully supported. One set of programs has had a profound impact: TRIO. TRIO is a group of federally-funded initiatives designed to encourage and support students who have financial needs or whose parents have not graduated from college. The first of the programs was introduced as part of President Lyndon Johnson's War on Poverty in the mid-1960s, and they have been effective tools in narrowing the achievement gap between America's highest- and lowest-income students. St. Scholastica operates five TRIO programs serving over 900 students annually. No private college in Minnesota has more. Each program has a distinctive mission and works with students at various stages of their education journey. Talent Search, Upward Bound and Upward Bound Math-Science programs work with middle and high school students to encourage them to continue their education and aid them in navigating the college selection, application and financial aid process. Student Support Services focuses on enabling students to stay in college to complete their undergraduate degrees. The McNair Scholars program inspires and empowers students to pursue graduate studies. "St. Scholastica's commitment to sponsoring five TRIO programs is a testament of our Benedictine values," said Ellen Johnson, Vice President for Enrollment Management. "These programs not only support CSS students, they also provide an invaluable service to middle and high school students in our region." The Saints community benefits in many ways. "First-generation students add to the vibrancy of our institution and the richness of the educational experience for all students," said Troy Abfalter '04, director of the McNair Scholars Program. "It's a wonderful asset to have so many first-generation students as part of our St. Scholastica community." Allen Cruz remembers the moment he found out he had been accepted to St. Scholastica. "I saw the letter in the mailbox and I was so nervous to open it," he said. "I thought it might be a rejection letter. I opened it by myself first and then told my parents later. They were so proud and happy for me!" Cruz's parents came to America from Mexico. His father is a meat cutter and his mother is a Spanish translator. They never had the opportunity to go to college, so that acceptance letter represented a dream come true for them as well as for him. "I visited other colleges, but I noticed St. Scholastica was smaller and felt more like a close-knit community. I felt very welcomed." He was introduced to Student Support Services in his freshman Dignitas class. "I applied and got connected to a TRIO counselor," he said. "She was a very intentional mentor and helped me develop leadership skills and the self-confidence I needed to succeed." Cruz says he's even surprised himself with his academic transformation. He wasn't very focused in high school, he said, and struggled a bit when he started college. But today, in his junior year, he's a biochemistry major and hopes to attend graduate school to become a Physician Assistant. 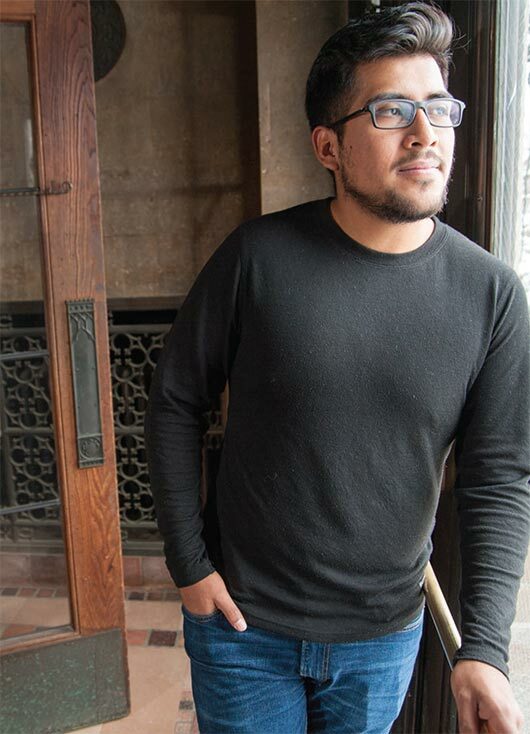 He's involved in the Latino Student Union, International Club, Student Senate, and social justice clubs and is an Anatomy/Physiology teaching assistant. "I wouldn't be where I am right now without the help of people in the TRIO program," he said. "It's made me realize it's OK to ask for help and you don't have to do it by yourself." "I can't even put into words how excellent the TRIO program has been for me. My counselor, Melissa (Doreus), is the person I go to with any struggles I'm having. I'm only a sophomore and she's already helping me think about what I might want to do after college." "My mom went to a session for parents during freshman orientation and heard about TRIO's Student Support Services program. I decided to apply and it was one of the best things I ever did. It turned out to be a huge part of my undergraduate experience."